Here in The Gambia, I have the privilege of working with a dedicated teacher named Sulayman L. Ceesay. He lives in a neighboring village and commutes to work every week, without fail. At home, he has a big family but constantly faces challenges to adequately provide enough food for his them on his low teacher's salary while also sending all his children to school and paying the subsequent fees that follow. Sulayman approached me humbly asking for help in finding a sponsorship program for his oldest son still at home. His son is named Lamin S. Ceesay and is currently in 7th grade but hoping to receive sponsorship for 8th grade and potentially the grades to follow. Lamin is a kind, soft-spoken, respectful boy. He is incredible intelligent, placing 2nd in his class of 37. Although he is young, he is ambitious and dedicated to his studies, with the aspiration of attending Nursing School for his higher education. In The Gambia, it is rare for a child to see such potential in their futures at such a young age. With the support of his father and mother, Lamin has been given the opportunity for that knowledge of his own potential and self-worth to manifest in himself. However, given the hard working and living conditions, family size, and low teacher salary, Lamin and his family struggle to find the funds to continue his education. With your help, and any amount truly helps, Lamin can continue his studies, and most importantly, continue to foster a love of education, an ambitious spirit, and an understanding that hard work reaps benefits. Lamin possesses high potential for a successful educational and afterwards professional career. Unfortunately, potential and opportunity are not synonymous for many people in this world. With your help, Lamin will be given the opportunity to reach his potential. You can help Lamin by clicking here. 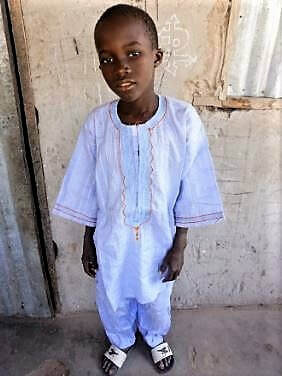 If you have a PayPal account, please consider a monthly donation that you can afford, since we can then know that you'll be with Lamin as he progresses through the grades.